The day was rather attractive and full of interesting results. The day ended with defeat of the leader. Here is the last day review presented by ESL. Top ranked Long Island Nets (19-9) recorded its ninth loss in Mississauga on Monday night. Visitors were rolled over by third ranked Raptors 905 (17-10) 113-87. It may be a crucial game in the contest for the top position in the league. Great defensive blocking was one of the keys in this match when Raptors 905 made 7 blocks. The best player for the winners was guard Jordan Loyd (193-93, college: Indianapolis) who scored 24 points, 6 rebounds and 6 assists. 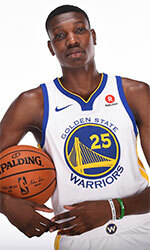 Canadian-Saint Lucian power forward Chris Boucher (208-93, college: Oregon) chipped in 22 points and 9 rebounds. Forward Okaro White (206-92, college: Florida St.) produced a double-double by scoring 17 points and 12 rebounds for the guests. The winner was already known earlier in the game, so both coaches allowed to play the bench players saving starting five for next games. 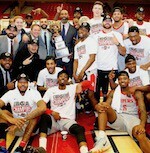 Raptors 905 have a solid series of three victories in a row. Defending champion moved-up to second place. Long Island Nets at the other side still keep top position with nine games lost. Another exciting game took place in Des Moines where fourth ranked Texas Legends (10-20) edged by one point their close opponent Wolves (9-21) 119-118. Canadian guard Xavier Rathan-Mayes (193-94, college: Florida St.) saved the victory with a double-double by scoring 17 points, 10 rebounds and 8 assists. Raymond Spalding contributed with 22 points and 11 rebounds for the winners. point guard Darius Johnson-Odom (187-89, college: Marquette, agency: BeoBasket) answered with 26 points, 8 rebounds and 9 assists (was perfect 7-for-7 from the free throw line) for Wolves. Wolves' coach rotated ten players in this game, but that didn't help. Texas Legends maintains fourth place with 10-20 record which they share with defeated Wolves. Wolves lost fifth consecutive game. They keep the fourth position with 21 games lost. A very close game took place in Westchester between Windy City Bulls and Knicks. Second ranked Windy City Bulls (15-14) got a very close victory on the road over their close opponent Knicks (17-13). Windy City Bulls managed to escape with a 3-point win 95-92 on Monday evening. It was a key game for the top position in the league. It was a great evening for Walter Lemon-Jr who led his team to a victory scoring 23 points, 7 rebounds and 8 assists. Jameel Warney responded with a double-double by scoring 31 points and 12 rebounds. Knicks' coach tested ten players, but that didn't help to avoid defeat in this game. Windy City Bulls keep a position of league leader. Loser Knicks dropped to the third place with 13 games lost. An exciting game was played in Washington. Second ranked Capital City Go-Go faced 3rd placed Drive. Host Capital City Go-Go (16-11) defeated guests from Grand Rapids (12-15) 115-107. It was an exceptional evening for Noah Allen who led the winners with a double-double by scoring 18 points, 10 rebounds and 7 assists. Newly promoted Capital City Go-Go maintains second place with 16-11 record having just one point less than leader Windy City B. Drive at the other side keeps the third position with 15 games lost. An exciting game was played in Canton. Fourth ranked Canton Charge faced their close opponent Greensboro Swarm. Host Canton Charge (12-15) smashed guests from Greensboro (12-16) 121-96. The best player for the winners was SirDominic Pointer who scored 20 points and 8 rebounds (on 9-of-11 shooting from the field). Since the result was very predictable, it gave the chance for the coaches to test many bench players which allowed the starters a little rest for the next games. Canton Charge have a solid series of three victories in a row. They moved-up to third place, which they share with Grand Rapids D. Greensboro Swarm lost third consecutive game. They keep the fourth position with 16 games lost. Top ranked Long Island Nets (19-9) recorded its ninth loss in Mississauga on Monday night. Visitors were rolled over by third ranked Raptors 905 (17-10) 113-87. It may be a crucial game in the contest for the top position in the league. Great defensive blocking was one of the keys in this match when Raptors 905 made 7 blocks. The best player for the winners was guard Jordan Loyd (193-93, college: Indianapolis) who scored 24 points, 6 rebounds and 6 assists. Canadian-Saint Lucian power forward Chris Boucher (208-93, college: Oregon) chipped in 22 points and 9 rebounds. Four Raptors 905 players scored in double figures. Forward Okaro White (206-92, college: Florida St.) produced a double-double by scoring 17 points and 12 rebounds and forward Theophilus Pinson-Jr (198-95, college: N.Carolina) added 13 points, 8 rebounds and 7 assists respectively for the guests. The winner was already known earlier in the game, so both coaches allowed to play the bench players saving starting five for next games. Raptors 905 have a solid series of three victories in a row. Defending champion moved-up to second place. Long Island Nets at the other side still keep top position with nine games lost. An exciting game was played in Washington. Second ranked Capital City Go-Go faced 3rd placed Drive. Host Capital City Go-Go (16-11) defeated guests from Grand Rapids (12-15) 115-107. Capital City Go-Go made 26-of-32 charity shots (81.3 percent) during the game. They shot the lights out from three nailing 15 long-distance shots on high 55.6 percentage. 26 personal fouls committed by Drive helped opponents get some easy free throw opportunities. It was an exceptional evening for guard Noah Allen (201-95, college: Hawaii) who led the winners with a double-double by scoring 18 points, 10 rebounds and 7 assists. Guard Chris Chiozza (183-95, college: Florida) accounted for 24 points, 5 rebounds and 5 assists for the winning side. Guard Marcus Thornton (193-87, college: LSU) came up with 34 points (!!!) and guard Isaiah Whitehead (191-95, college: Seton Hall) added 17 points and 9 assists respectively for Drive in the defeat. Both teams had five players each who scored in double figures. Newly promoted Capital City Go-Go maintains second place with 16-11 record having just one point less than leader Windy City B. Drive at the other side keeps the third position with 15 games lost. Another exciting game took place in Des Moines where fourth ranked Texas Legends (10-20) edged by one point their close opponent Wolves (9-21) 119-118. Texas Legends players were unselfish on offense dishing 24 assists. Canadian guard Xavier Rathan-Mayes (193-94, college: Florida St.) saved the victory with a double-double by scoring 17 points, 10 rebounds and 8 assists. Forward Raymond Spalding (208-97, college: Louisville) contributed with a double-double by scoring 22 points and 11 rebounds for the winners. Point guard Darius Johnson-Odom (187-89, college: Marquette, agency: BeoBasket) answered with 26 points, 8 rebounds and 9 assists (was perfect 7-for-7 from the free throw line) and guard Jonathan Stark (183-95, college: Murray St., agency: Pensack Sports) added 26 points in the effort for Wolves. Both teams had five players each who scored in double figures. Wolves' coach rotated ten players in this game, but that didn't help. Texas Legends maintains fourth place with 10-20 record which they share with defeated Wolves. Wolves lost fifth consecutive game. They keep the fourth position with 21 games lost. An exciting game was played in Canton. Fourth ranked Canton Charge faced their close opponent Greensboro Swarm. Host Canton Charge (12-15) smashed guests from Greensboro (12-16) 121-96. Canton Charge dominated down low during the game scoring 58 of its points in the paint compared to Greensboro Swarm's 38 and made 21-of-25 free shots (84.0 percent) during the game. Canton Charge looked well-organized offensively handing out 23 assists. The best player for the winners was swingman SirDominic Pointer (198-92, college: St.John's) who scored 20 points and 8 rebounds (on 9-of-11 shooting from the field). Forward JaCorey Williams (203-94, college: Middle Tenn.St.) chipped in 18 points and 6 rebounds. Guard Dwayne Bacon (201-95, college: Florida St.) produced 20 points and 9 rebounds and power forward Chinanu Onuaku (208-96, college: Louisville) added 10 points and 12 rebounds respectively for the guests. Five Canton Charge and four Greensboro Swarm players scored in double figures. Since the result was very predictable, it gave the chance for the coaches to test many bench players which allowed the starters a little rest for the next games. Canton Charge have a solid series of three victories in a row. They moved-up to third place, which they share with Grand Rapids D. Greensboro Swarm lost third consecutive game. They keep the fourth position with 16 games lost. A very close game took place in Westchester between Windy City Bulls and Knicks. Second ranked Windy City Bulls (15-14) got a very close victory on the road over their close opponent Knicks (17-13). Windy City Bulls managed to escape with a 3-point win 95-92 on Monday evening. It was a key game for the top position in the league. Strangely Knicks outrebounded Windy City Bulls 57-45 including 43 on the defensive glass. They looked well-organized offensively handing out 23 assists. It was a great evening for guard Walter Lemon-Jr (190-92, college: Bradley) who led his team to a victory scoring 23 points, 7 rebounds and 8 assists. Forward CJ Fair (203-91, college: Syracuse) helped adding 21 points, 12 rebounds and 4 assists. Four Windy City Bulls players scored in double figures. Center Jameel Warney (203-94, college: Stony Brook) responded with a double-double by scoring 31 points and 12 rebounds and guard Kadeem Allen (191-93, college: Arizona) scored 18 points, 6 rebounds and 5 assists. Knicks' coach tested ten players, but that didn't help to avoid defeat in this game. Windy City Bulls keep a position of league leader. Loser Knicks dropped to the third place with 13 games lost.